We don’t just “go out” to eat here very often. Usually we only eat out while we are traveling or we treat ourselves at the BIS’s Sports Club, a country club kind of place that the BIS owns for its employees. However, we were told by a friend of ours from the US that there was one restaurant in Basel we had to experience. 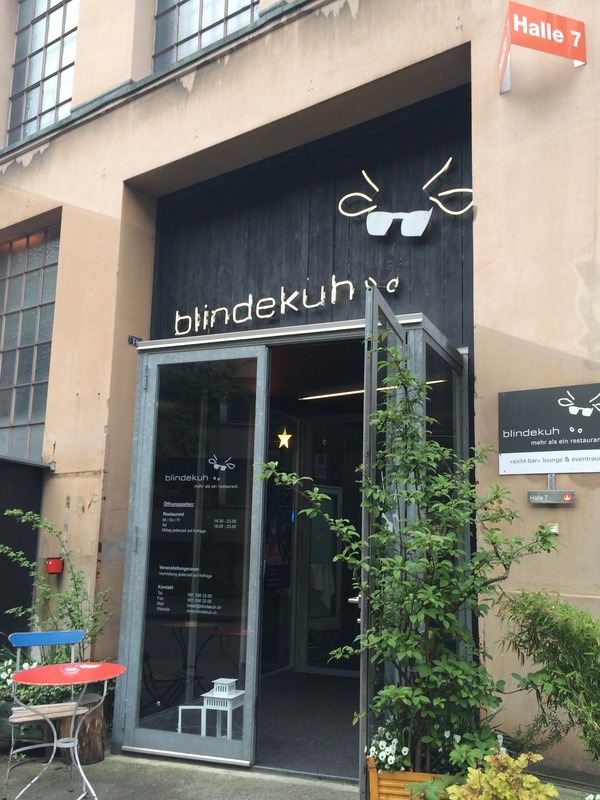 Die Blindekuh or “The Blind Cow”. The Blind Cow is a relatively famous restaurant because the diners eat in the pitch black dark. Word tends to spread about a restaurant where the main concept is not being able to see your food or your dining companion. If this sounds somewhat familiar that’s because this restaurant concept was featured as a crime scene in a Season 8 episode of the original CSI: Crime Scene Investigators. You know, back when Grissom and Sara’s relationship was just getting found out about and the show was still good? No murders happened during our restaurant experience, but I felt prepared. Not all of the restaurant was in darkness. The lobby was fully lit and there was a bar above the restaurant called The Sighted Cow. 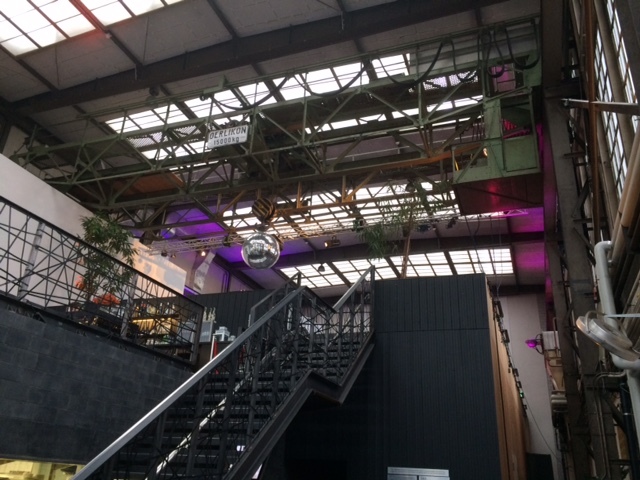 The lobby and the stairs up to The Sighted Cow bar area. The doorway to the restaurant is that dark hole right under the stairs. The maitre d’ and chefs were not blind, but the servers are all blind or partially sighted. They move about with practiced ease that made me feel like a bumbling cow. I guess that could mean the name refers to the diners? The menu was, thankfully, in the lobby. Up on a flat screen TV a list of 3 appetizers, 2 main courses, and 3 desserts alternated with list of drinks. Or, if you have a horrible memory like me, you could make your life a lot easier and just order Surprise Menu 3 or Surprise Menu 4. The 3 and the 4 refer to how many courses you get, not separate menus, as we found out. I got Menu 4 and mine came with a delicious bacon-y soup. Mark got Menu 3 and had the privilege of smelling my soup. It is incredibly hard to pass a spoon filled with soup across the table to someone in the dark. Not that we didn’t try. I bet their linens cleaning bill is huge. There were lockers in the lobby so you could safely store your coats, bags, phones, and other valuables. I thought that was pretty sensible, but after we got into the dining area I thought it was brilliant, because once you dropped something in there you were never, ever going to find it again. It was dark in there. Which is the point. But it was DARK!! Like a politician’s soul, dark. If you want to experience this level of darkness I recommend that in the middle of the night have all your curtains pulled and lights off and then go into a closet away from any windows. And then shut your eyes. It was darker than that. It was so dark that our eyes hurt from the habit of straining to perceive even a speck of light. But Batman would have felt right at home. After a while we noticed that we would close our eyes while we were talking to each other. Maybe to stop our brains from working overtime to find light and so we could just focus on the sounds around us? I also noticed, however, that when I was eating I would have my eyes open and I would be looking down towards the plate I couldn’t see. Our server was Ruth. She was absolutely fantastic. She really and totally took care of us – from leading us into the restaurant and guiding us physically to our chairs to telling us where the bread basket was. She would describe where things were at the table and she checked on us often without being intrusive. We had gazpacho waiting for us to drink at the table. I experimented with dipping my fingers into it and for a moment thought it was a salad dressing, but Ruth came to the rescue and told us to drink it. Our first course was a salad with a savory asparagus creme brulé. That’s when we found that eating with a knife and fork was going to be tricky. When one is eating in the dark one cannot feel if there is any food at the end of a fork. And, therefore, one does not know (a) how much, if any, food one is attempting to put in one’s mouth; (b) what kind of things are in the salad one is eating; (c) how securely the food is positioned on the fork (i.e. is it going to end up in your lap about halfway to your mouth). But we persevered! And the salad was eaten! Huzzah! And then came my soup and the moment we discovered that you need a lot of tapping in order to send an aural message as to where your hand with a spoonful of hot soup might be located. It is also when we discovered that perhaps you should only try that once. It is also the moment I decided that silverware is overrated and if you are going to drink soup in the dark you should just wait until it cooled and then start slurping right from the bowl. Mark caught up with my realization during the main course. We had lamb crusted with cheese, herbs, and breadcrumbs accompanied by peeled and sauteed asparagus, and roasted rosemary red-skinned potatoes (not that I could see their skins to confirm). There was also a piece of roasted broccoli hiding in there. We started with knives and forks, dutifully trying to cut bite-sized pieces of meat. About 3 cuts in I chucked the silverware and just picked up the meat and ate it with my hands, ripping off pieces of meat with my teeth. (Here is where I decided their napkins linens bill must be huge. They were large and extremely good at absorbing the buttery goodness of my fingers.) Mark made it to about 4 cuts before he decided eating like a Viking warrior was the way to go. I felt immense sympathy for Helen Keller being told she had to eat with a knife and fork. I hope, when she was alone and there was no one around to judge her, she decided to eat with her fingers. And a few words about pouring wine in the dark. Holy crap. We ordered a carafe of wine to split between the two of us. The glasses came full and then the remainder was placed in the middle of the table. About the middle of the main course I discovered my glass was empty and I needed to pour myself more wine. But how? I couldn’t see the opening of the glass or the lip of the wine carafe. And I couldn’t see to determine how full the glass was? I mean, what if I spilled the wine??? My solution was to hold the carafe just a little bit down from its lip and then to have the index finger of my other hand somewhat in the glass. I would touch my fingers that were on the carafe to the lip of my glass and the lip of the carafe to the index finger hanging into the glass. The wine would pour down my finger (so I would know it was going into the glass and not onto the table) and when the wine reached my index finger I would know it was full enough, but not too full. Success! A bit gross, but all the wine went into my glass! Then we had desert. A raisin and rhubarb crisp with some kind of citrus foam on one side and vanilla whipped cream on the other. At this point we weren’t even pretending to eat with forks. We just started picking up the bits of crisp, raking our fingers through the foam and cream and stuffing them into our mouths. We were laughing and joking and having a great time. It was like embracing toddlerhood again. The only thing missing was the bibs and the dog waiting underneath the chair hoping for some dropped offerings. The restaurant must know this is going to happen because after dessert Ruth showed with with hot, moist washcloths. Suitable for cleaning off your hands, arms, and face. Yay! They say that when one sense is taken away the others “boost” themselves to help out. I’m not sure if that is achievable in a 2 hour dinner, but the food was absolutely delicious. We could distinctly taste the smokiness of the bacon in my soup, the rosemary on the potatoes; the buttery cheese on the lamb, the sharply tart rhubarb in the dessert. So, it is possible that our senses of smell and taste were heightened somewhat. We also successfully used our ears to hear where our silverware and glasses were and I was able to build a mental picture of the table setting. I also used taps and thumps to be able to locate Mark’s hands (I’m pretty sure they were Mark’s). Once we were done eating we regressed to being twelve year olds (or progressed since we were just feeling like toddlers). We pretended we were ninjas and were trying to stealthily find each others faces at the table. We would take turns sticking out our hand in the dark as quietly as we could and then make a jab for each others cheek. It was stupidly hilarious and we were rolling around in our chairs laughing that the other tables couldn’t see our idiocy. We were stealthy restaurant ninjas! And then we were done. We were full and loopy and ready to take in the light again. When Ruth came by we let her know we were ready to leave and she carefully guided us back out of the dark and into the lit lobby. And holy smokes it was bright. There was so much light that my vision was actually blurry for a minute. Even as we walked down the streets in the night the lights from store windows and street lamps seemed really, really bright. If I were rating it I’d give it 4 out of 5 stars. The food was excellent. The service was superb. And it was an incredibly unique eating experience for the adventurous. Would I eat there again? Maybe. If Shaun (or another good friend) came in from out of town I would take her there if she were game. I don’t know if Mark and I would seek (pun not intended) it out again during our limited time in Basel, but we are so very glad we went. Mark does tell me, though, about an very intriguing couple that regularly eat at The Blind Cow. According to a friend (which probably makes this an urban legend) there is a man and a woman that eat there about once a month. The woman arrives first and is seated into the dark dining room. The man arrives about 20 minutes or so later. They eat and converse and when they are done the woman leaves. 20 minutes later the man leaves. Apparently they have never seen each other even though they have been having dinner together once a month for a few years. How tragically romantic! It feels like a movie Cary Grant and Deborah Kerr would have starred in. And now I have to go re-watch An Affair To Remember.